Catit Design Senses Food Maze Review | A Cat Called Freya, and Teego Too! ← Amazing Free Giveaway Coming!!! Well, this is our first review of five, and we picked the one that we thought might be the most exciting to review first! Be sure to read all the way to the bottom to WIN one in a competition! It’s called the Food Maze, and it’s a Puzzle Feeder. That means that the cat has to complete a task in order to be rewarded by a treat. A human puzzle feeder would need to be very complicated with knobs and dials and switches to make it hard for them, but for a cat it can be a lot simpler. A cat’s natural instincts are to hunt and to scavenge, so they like to chase and kill, or discover food by looking carefully. You put the treats or dry biscuits in the top, and the kittie has to knock the biscuits from the top layer into the second layer, and then knock them into the third. After the third layer, it drops into the tray at the bottom, and then Chatzi steals your reward! I’m sure that’s not how it’s meant to be, but that’s how it works in our house! Our first impression of it was very good. The online price is around £10 – £15, (or $10-$15) which is incredibly cheap considering what it is, but it feels very solid and doesn’t feel like thin plastic that’s going to break within a week! It looks kinda nice too, with blue tinted clear plastic and funky lime green on the inside. With all three of us playing on the food maze, it got a bit chaotic, and there were paws flying everywhere, and treats dropping out all over the place, but if you watch the video, later on when Freya and Chatzi were locked out of the room, Teego used the food maze on his own and it worked very well, and he was very calmly figuring things out. There is one thing that we’d like them to change on the next version, and that’s the lid. All of us will eat the treats through the hole in the lid as that’s the easiest way to get to the treats! So Daddycat put a small plate over the opening and that stops us cheating. We expected it to fall over within 2 minutes, expecting either Freya or Chatzi to give it a pull, and it would all come tumbling down! But in reality, there was only one instance when it was pulled, but the cat let go and it stood back up again, so that’s a great mark for stability. We really liked this – it’s a sensible price, I would genuinely have expected it to be double the price, and since food is involved, I doubt cats will ever get bored of it. I’m going to award the Catit Design Senses Cat Maze a total of FIVE PAWS out of FIVE! 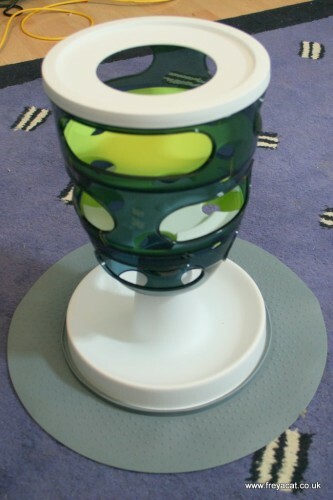 The lovely people at Hagen have given us TWO of these fantastic puzzle feeders to give away as prizes! They want this to be a Trans-Atlantic competition – there’s one for kitties in The USA, and one for kitties in the UK! We’re really sorry for kitties anywhere else, but we can’t afford to send them anywhere else! The competition is now CLOSED! Visit us again soon or subscribe, to enter our other TWO competitions coming up! pee ess… We haven’t received any payment whatsoever for this review, other than the products theselves for review for free. It’s our genuine and honest opinion. UK – we’ve already got the ball racing circuit thingy which is fun but this looks even better!! USA. Please enter us. Our mom is always looking for good food puzzles for us. She says even if we don’t win, she’s gonna buy this for us (if she can find one). UK: Mummy says that I need something to stop me getting at treats too easily as my belly is getting larger – she calls me the tubby tabby – how rude! USA. I would love to have one of these – i used to be able to chase mice and flying things outside, but now I’m stuck in this boring apartment with nothing to chase aside from when my hoomans play with me. I am getting older so I don’t have the initiative to chase the ordinary things anymore, and I need something a little more interesting to catch my attention! UK – We would love a chance to win the competition – we love to play and this looks good fun and also you win treats!! Pepper and Johnny would love this (especially if I hid some treats in with the regular food). They are both inside cats, and always looking for entertainment. It’s a must have!!! USA – Looks like fun with more than one at the puzzle at the same time. @needaphone Wow Rollie would love this and perhaps bring him out of his shell. Uk. US – Wow we’re impressed! And we’re glad the squabbling girls were put aside so Teego could get his share. Haha! Yes, “Thinky” That made us laugh too!!! But he is too. USA- Looks like a riot to watch, would love to win one for my kitties!! USA! USA! I need to win because I’m just to smart for my own good and I need something to challenge my brain. Chasing ladycats is fun but exhausting… You know what I mean Chatzi!!!! USA – We would love one of these. 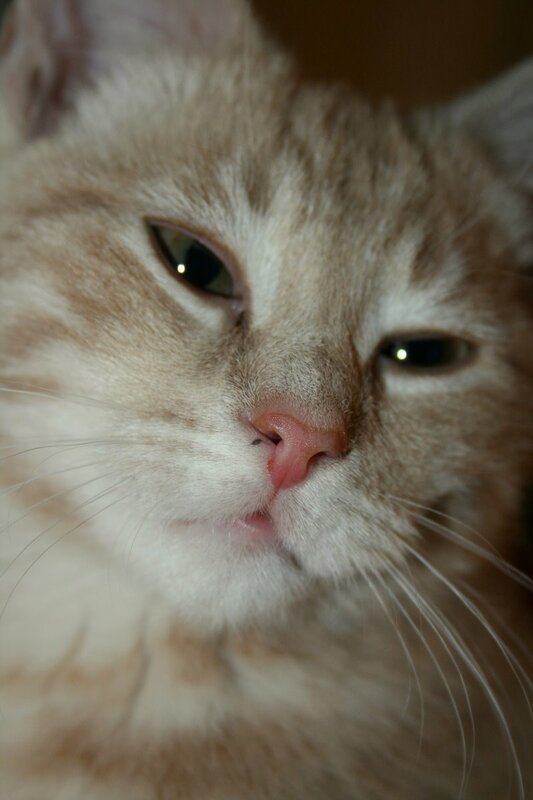 We think you kitties are so beautiful and smart. USA I loved how Teego figured out how to cheat! And I don’t know how you cope with *two* Bengals! You must be a patient, patient man! I’d love one of these for my two oldsters since I am always looking for enrichment ideas. What a great toy and a great price. We’s love to try and win one! USA..Thank you! USA. This looks like a lot of fun! Please enter us . . . Me Me Me! (yes, Taffy, for you) for one. MeWowZa…when we first saw this, we thought What a great diet aid…but you are right…the hole in the top is a bit counterproductive. But we’d still love to win one…we b in the US of A.
I’d love to enter, and I’ll give it to my brother in Germany if I win! That’s a snifty lookin’ puzzle! I wonder if my big ol’ wonky-paws can get into those little holes? I’d sure like to try! USA – Please enter us in the competition. I think this would really help Tanner lose weight, as he could work for his food! USA! Holy Catnip — Cheeto and the gang think this looks pretty fun — and respectfully ask to enter and win this contest! 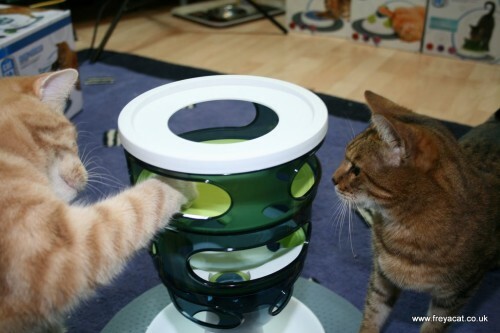 What a great toy — and an especially great idea is covering the top to prevent helping one’s self to extra treats!!! UK – This looks like great fun and I’m sure I would enjoy playing with it, especially as food is involved. USA-Hi Freya, Teego and Chatiz!! That looks like a really cool thing for kitties!!! We would like to be entered into the contest!! UK. I’d love to win one of these!